1708 Gallery is pleased to announce its upcoming exhibition, Sören Hüttel: Space time colour eclectic, on view from October 19 through December 8, 2012. 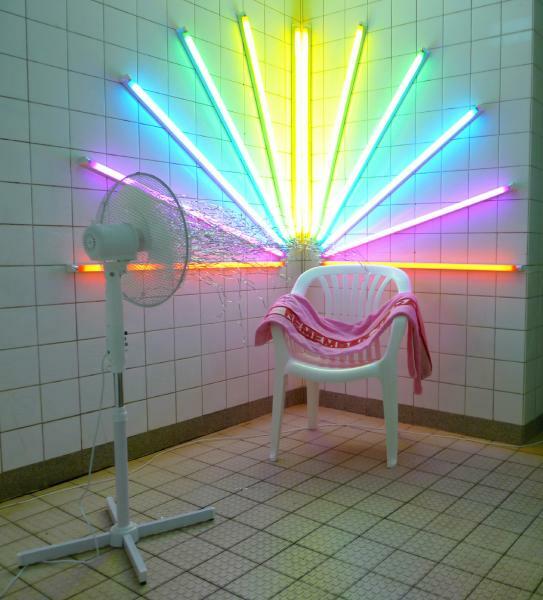 Please join us for an artist talk and opening reception on Friday, October 19 from 6 to 8 p.m.
Hüttel’s installations combine neon color, various light fixtures, abstract sculptural elements, found and handmade objects, and mass-produced items in arrangements that suggest cultural, domestic and commercial interior spaces simultaneously. Their presentation implies that these objects are not intended to be interpreted as individual works so much as a matrix of things, illustrating the complex relationships between the assorted objects, light emitting elements, and the architecture of the gallery. Space time colour eclectic reflects Hüttel’s interest in eclecticism--the heterogeneous quality so often ascribed to contemporary society--as an artistic philosophy. Hüttel’s practice contrasts the stuff that surrounds us by exhibiting it all together--low, high, and in-between. 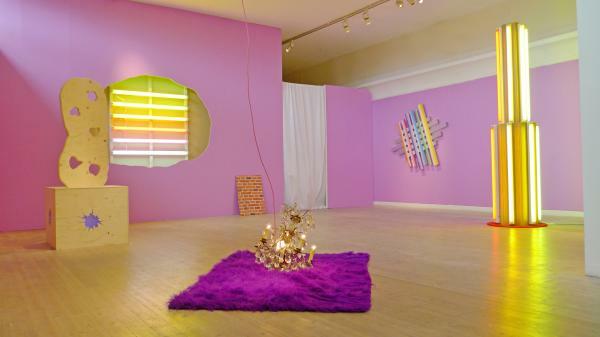 Hüttel haphazardly assigns equal importance to a magenta faux fur rug, rainbows, black lights, wood laminate, and Saturn’s rings, embracing the possibility for each thing to change and impact its neighbors. Distinctions previously established to identify and separate the “cultural,” “domestic,” “commercial,” or “stylish” erode, and are replaced with questions about authenticity, function, attitude, and imagination. Sören Hüttel (b. 1976, Randers, DK) graduated from Funen Art Academy in Odense, Denmark and the Glasgow School of Art in Scotland. 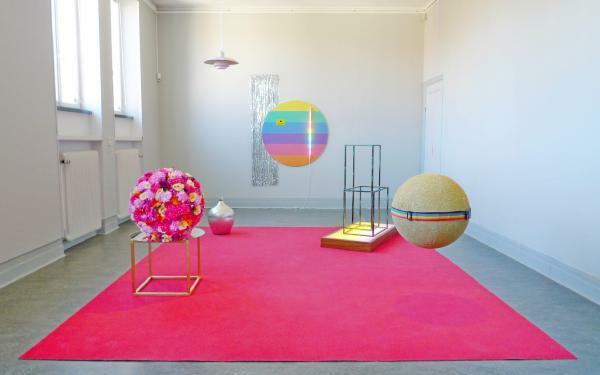 Solo exhibits include “The eclectic is now” at David Dale Gallery in Glasgow and “Views on the eclectic as idea and the generous space as ideal” at Kunsthallen Brandt Klædefabrik in Odense. 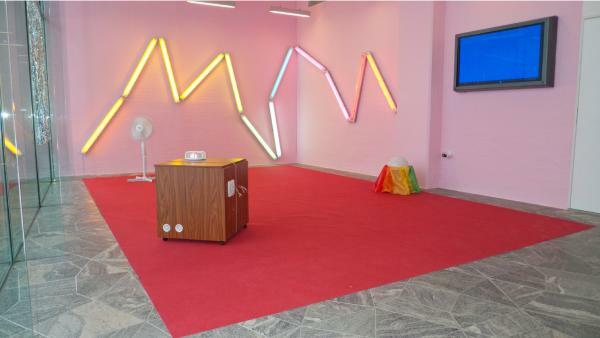 He has exhibited in group exhibitions at the 11th Luleå Art Biennial in Luleå, Sweden and at Stattbad in Berlin, in addition to various exhibits in Denmark, Latvia, China, Scotland, Sweden, and the United States. Sören Hüttel lives and works in Copenhagen, where he is an instructor at the VERA School for Art and Design. This is his first solo exhibition in the US. For more information about Sören Hüttel, please visit www.huttel.org. Space time colour eclectic is sponsored in part by the Danish Arts Councl Committee for Visual Arts. Accommodations for the artist generously provided by the Linden Row Inn.